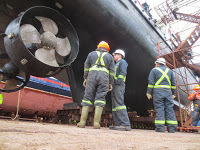 After many years on “conventional” shaft and propeller powered vessels, I am quickly coming to appreciate the complexity of Z drives, right angle drives, or whatever these are called in your neck of the ocean. With three dry-docking in three contracts, on three different boats, in one year, I am getting some familiarization with these complex machines. My latest adventure involves a Kawasaki Rexpeller drive, which had earlier eaten a rope, supposedly damaging the stern seal. Water was now coming into the unit at an alarming rate. With no facilities nearby, the only options was to renew the oil as much as possible and fill it to the top of the unit, creating a static pressure to counteract the water pressure. These 2000 hp units take about 1500 liters of oil, so getting rid of this oil, and having new oil to replace it with, can be quite the logistical challenge, especially being in a tug, in a very remote operating environment. To further constrain the influx of water into the unit, we shifted some fuel around and used our aft potable water tanks to lighten the stern, in hopes of reducing inward pressure on the unit. These tactics seem to work, as the “oil” level in the unit remain constant for the rest of the trip. 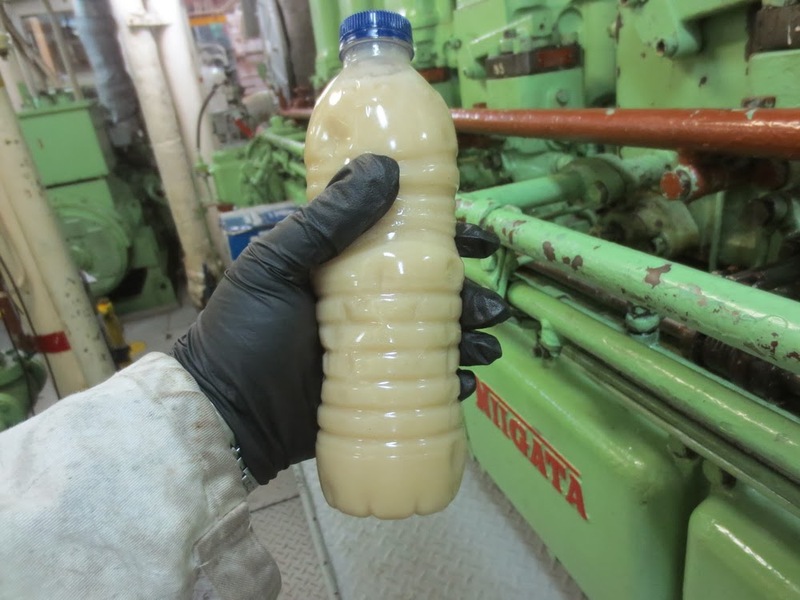 The oil in the unit was severely contaminated with water. The first sample I took had three layers to it; 80% milky emulsified oil, 2% greenish crap, and the rest, clear water. Not a very good mix, to say the least. The unit has 4 filters, but only the small one for the Clutch Pump seem to pick up sludge and get plugged up. 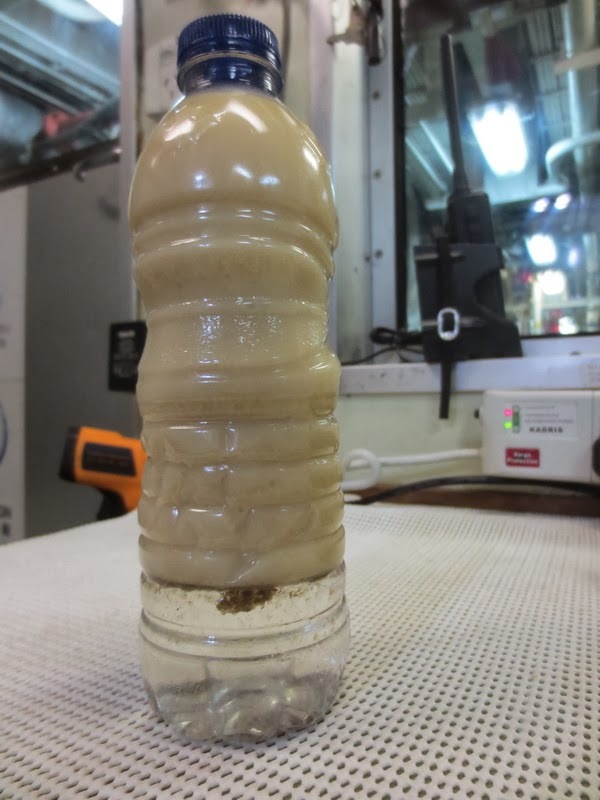 The sludge was unlike anything I had ever seen before, a greenish brown, gel-like substance that would easily meld together, but was very difficult to remove. The stuff just would not break down. I tried the usual suspects, diesel, degrease, dish soap, hot water, brake cleaner; nothing seems to break this stuff down. The Second Engineer used de-scaler which seem to do the trick, but took some additional mechanical effort to get the filters clean. Very strange stuff. I also observed another phenomena during this ordeal, which I am not sure was caused by this particular incident, but was worth noting. The filter housings, like most hydraulic system housing, has a filter restriction gauge at the top (magnetic). This gauge is connected to the bypass valve built into the housing, where as the filter plugs up, the pressure lift a pressure relief valve opening to the pump suction directly. The housing is made of aluminum and the valve disk, made of bronze. 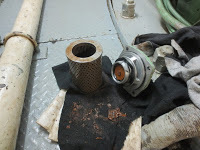 The valve disk moves up and down in a bore within the lid of the filter housing. 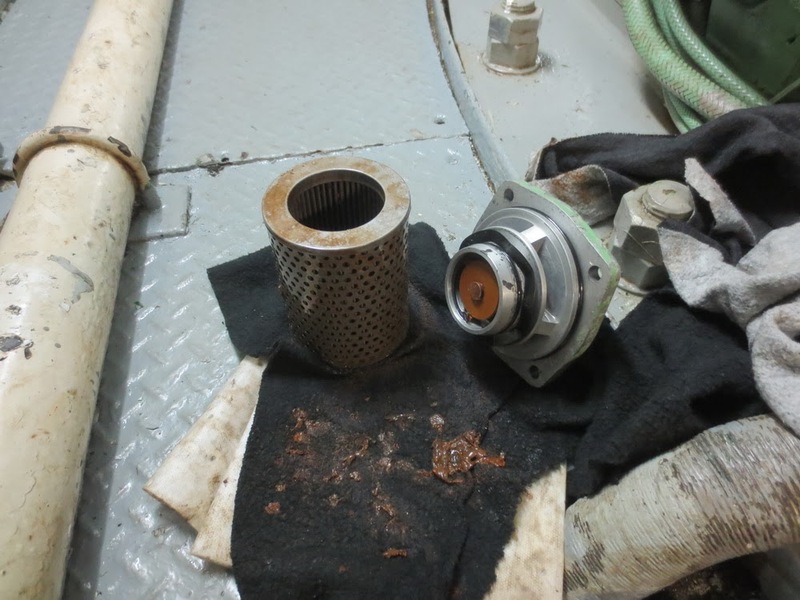 It was interesting to see that galvanic corrosion had damaged the unit, and actually seized the valve, which also meant the restriction indication was not functioning. Of course this meant as the filter picked up the sludge, it plugged; without the bypass functioning, cause stress in the pump, illustrated by heat and noise. 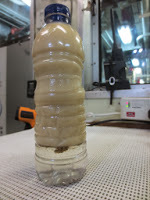 It could be that the z drive has had water issues before, but there was damage, pitting, discoloration, etc, to suggest the speed of damage due to emulsified water flowing through the filter unit, creating a galvanic reaction, was astounding. Incidentally the oil, Shell Tellus 68, seemed to suspend the water quite well, considering how much was in there. Immediately some water settle out of it, but after that, it remained milky for 5 or 6 days before the water dropped out, and then the oil cleared up quite quickly, over one day. Very neat to see.